Last updated on January 13, 2014 April 25, 2018 by Daniel Waldron for Armagard Ltd.
Digital signage enclosure specialists, Armagard, will be exhibiting at the 2014 Digital Signage Expo (DSE) in Las Vegas, 12th-13th February. Drop-in on our digital signage enclosure display. The Digital Signage Expo (DSE) is held in high esteem and viewed as the world’s largest international trade show dedicated to showcasing digital signage, interactive technology and OoH (Out-of-Home) networks. DSE gathers together business representatives from all over the world with interests in the digital signage industry sector. DSE provides the perfect platform for networking between companies and consumers alike and is also an event that ‘educates’, hosting practical seminars and keynote speeches for those in attendance. 2014 will mark the 11th year of the annual event held in Las Vegas, and will be hosted at ‘The Sands’ Expo and Convention Centre, a new location with a new and improved space plan. Armagard will be in attendance, among nearly 200 other exhibitors expected at the Expo. You can find us at stand 1124, showcasing precision engineered, state-of-the-art, digital signage enclosures, specifically designed to protect digital signage displays in outdoor and indoor environments. Armagard will be attending the Digital Signage Expo for the third time, having made our debut appearance back in 2012. The event has proven to be pivotal to Armagard’s pursuit of international growth, particularly in the USA, aiding us in establishing the Armagard brand and increasing recognition. The Digital Signage Expo also provides the perfect opportunity for Armagard to unveil its digital signage solutions to the world. 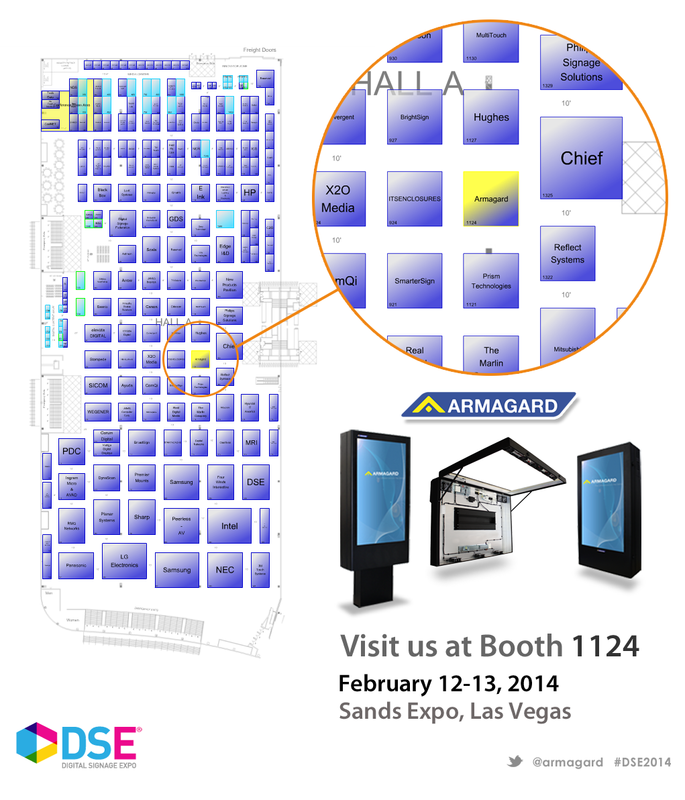 Find Armagard at booth 1124, DSE 2014. Company CEO – Mark Neal. North American Sales Manager – Keith Britton. Armagard’s Marketing Guru – Mike Thomas. US Sales Specialist – Paul McCabe. Come and introduce yourself! Armagard’s specialist representatives will be happy to discuss the benefits of purchasing a digital signage enclosure with you. It also gives you the opportunity to view some of the latest and classic innovations featured across our product range. Don’t miss out! Armagard’s award winning products and designs will be showcased to the world once again at the annual event featuring new, precision designed, LCD digital signage enclosures and state-of-the art technologies, alongside existing product ranges. The pick of the new products on display will be the 47” quick service restaurant digital signage enclosure. Designed to accommodate a 47” LCD screen, the quick service restaurant digital signage enclosure serves as an interactive menu enabling fast food customers to select food orders via the touchscreen display. The quick service restaurant digital signage display requires adequate enclosure protection in order to endure numerous environmental elements, both indoors and outdoors. Furthermore, constant human interaction could also take its toll on exposed displays, therefore, a digital signage enclosure is vital to protect any investment in an LCD digital signage display. Armagard’s 47” quick service restaurant enclosure is an engineering feat that combines style with substance, resulting in a unit that is aesthetically pleasing, yet robust enough to protect against numerous risks such as adverse weather conditions, vandalism and physical impact. In addition to new innovations, Armagard will also be presenting existing products, classic designs that are used all over the world in territories such as the USA, South America, Europe and the Middle East. To find out more about Armagard products visit our official website. Don’t worry! If you miss out on DSE, you can catch us at the Integrated Systems Europe (ISE) exhibition the week before. Join us in Amsterdam at the RAI, 4th-6th February, 2014. You’ll find Armagard at stand 8-M245, in Hall 8, where French, German and English speaking representatives will be waiting to chat with you. We look forward to meeting you there! This entry is filed under Articles, Digital Signage. You can follow any responses to this entry through the RSS 2.0 feed. Both comments and pings are currently closed.